Linda Ledbetter has been under the weather this week so send her some virtual chicken soup love on her blog over at Studio L3. You have from today until Sunday, May 28th to leave a comment. Winners will be announced on the eP blog Tuesday, May 29th. Join the E-Team in our journal adventure and upload your own journal page here (see below). We are going to pick 2 people to join us next month. You have until Sunday June 3rd to post your journal page inspired by our monthly quote. 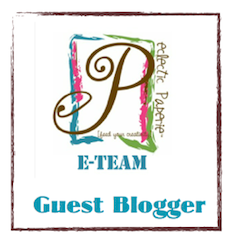 We'll pick and announce the next E-Team guest bloggers Fri, Jun 8th. "A woman is like a tea bag - you never know strong she is until she gets in hot water." I will be posting my project on Friday with a little background about this month's inspirational words from Eleanor Roosevelt. Thanks for having this hop, and the chance to win. Daisy, thank you for the wonderful opportunity to join your team for this hop. Everyone has made such wonderful pages. Everyone had interesting interpretations of a great quote. Thanks for the fun hop. Another fab hop! Love the various interpretations of the quote. Another great blog hop, Daisy! And I really like the addition of the guests bloggers. Thanks for inviting us to play along! Loved everyone's pages. So creative. Another amazing EP hop!!! Thanks to all for the beautiful pages! I eagerly anticipate your blog hops. Great projects, as always. Your guest designers did a fabulous job! Can't wait to see your project. The eP blog hops are so much fun! This challenge is open to interpretation and all the entries have been so unique. I've started my entry...should finish it tomorrow. done the blog hop...learned some new technique..tx for sharing! I recognize and feel good. The content of your article. Really impressive.